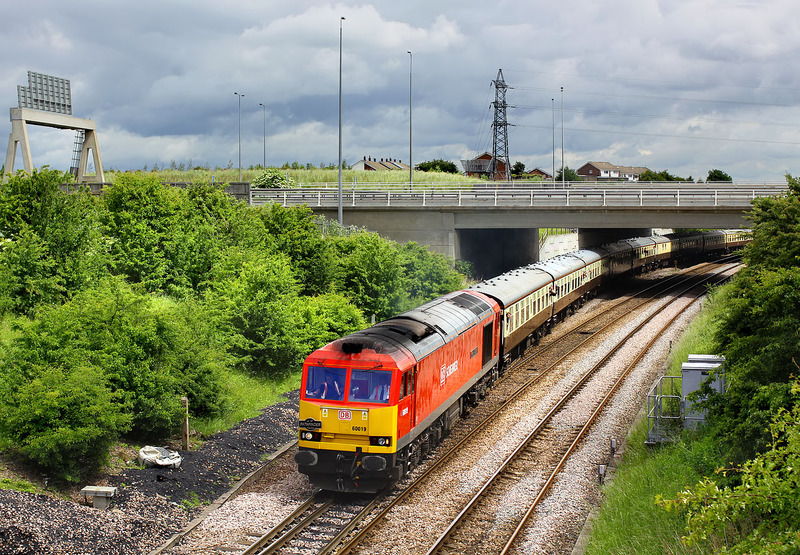 60019 Port of Grimsby & Immingham slowly negotiates Pontefract East Junction on 22 June 2013 with the Pathfinder Tours 1Z81 09:56 Sheffield to Leeds 'Loopy Doughnut' railtour. I particularly wanted to photograph the train here, as it shows it coming off the short single track chord from Ferrybridge North Junction. This links the York to Sheffield line with the Knottingley to Wakefield route. The M62 motorway crosses in the background, which seems surprisingly free of traffic at this particular moment. Also surprising, and very welcome, was the brief burst of sunshine on an otherwise generally cloudy day.